The moving day finally comes, and their grandpa comes over to have brunch and say goodbye. He brings along two presents for Ethan and Ella. Ethan receives a gold coin with a globe on one side and a hawk on the other. Ella receives a purple journal as Grandpa knew all about her love for writing Their mother and father go out to buy some things and they leave behind a to-do list to complete before they come back. They had to leave the house at 3p.m. Just when, they are about to start the list Ethan is unable to find his coin. Their grandpa offers to do the list for them while they look for the coin. They start looking everywhere. 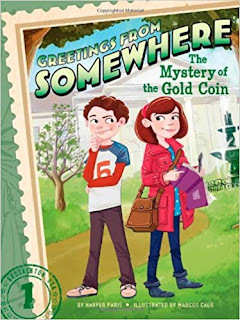 They go to the bakery, the bookstore, the library but they are not able to find it. Where is the coin? Do they find it in time? This is the plot of the story. It has a very simple plot. 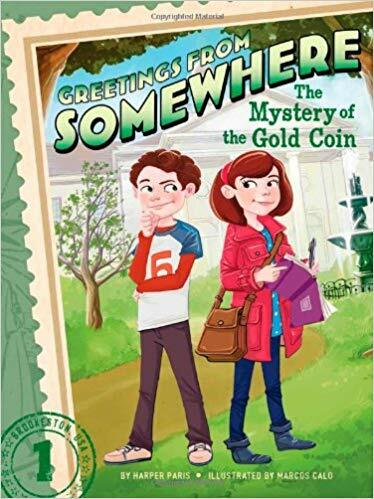 Even though it is called the ‘Mystery of the Gold Coin’ I didn’t feel it was a mystery. Ethan just loses his coin and the way they find it, is not that interesting. The author seems to be trying very hard to make it a mystery, but it is actually just a case of forgetfulness. Ella is very excited and notes down almost everything in her journal, even though she doesn’t need to. I feel that this book is not for my age group. It is much more suitable for a 7-9 age group. I didn’t enjoy reading it. I felt that it is boring.